Disclaimer: I received a free review copy from No Starch Press. I was very excited to read this book because space has always been one of my favorite LEGO themes. In some ways this book exceeded my expectations, particularly in the way that it pays homage to the old LEGO themes of classic space, ice planet, Blacktron, and Space Police, while creating things that are new and different. The book is different from most LEGO books I can think of in that it tells a fictional story, starting from the US space program in the 1960s (Neil Armstrong’s footprint on the moon on p.7 is particularly nice) through to the distant future. 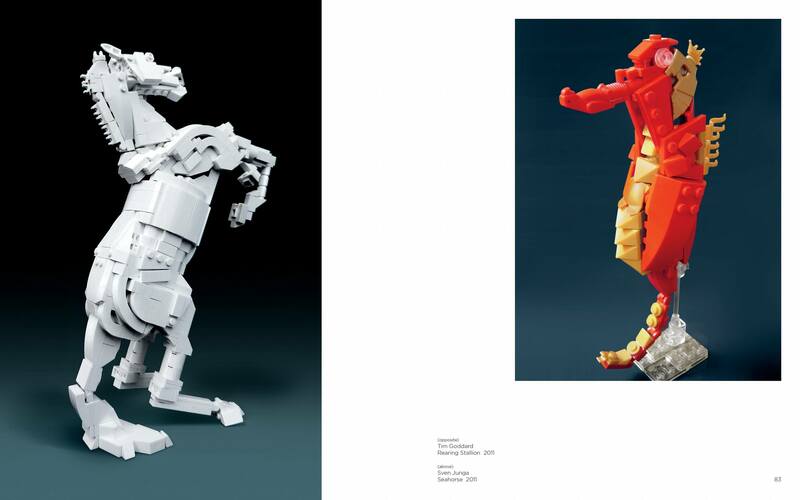 It uses photographs of LEGO to illustrate this science fiction, as well as 3d renderings of the step-by-step instructions on how to build some of the models. These instructions are the only real ways in which the ‘fourth wall’ of the fictional universe is broken. The story is a neat excuse for the authors to bring in elements from the various themes that I mentioned, starting with classic space (“The Federation” – pp. 20-59). If you’re unfamiliar with this theme, see http://lego.wikia.com/wiki/Classic_Space?file=Classic_Space_1979.jpg. The models that they show for this do a great job of keeping the color scheme (yellow, blue, grey) of the builds, while adding much more sophistication and detail than were ever present in the original sets. The story continues on to Ice planet (see e.g. 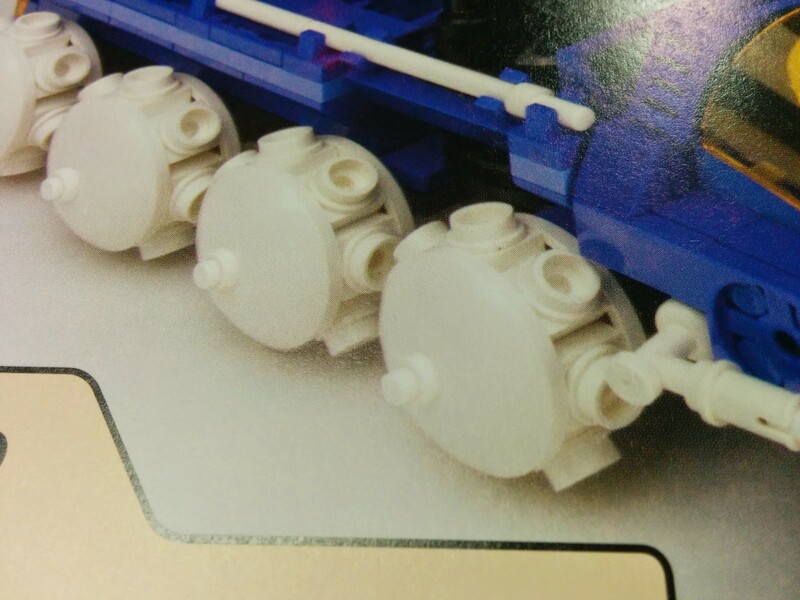 http://lego.wikia.com/wiki/Ice_Planet_2002), which this story renames as “Inhospitable Climate Engineers (ICE)” (pp.62-85). This was one of my favorite themes growing up, and I love how the authors have retained the blue, white, and orange color scheme in their builds, while introducing entirely new concepts, such as the ICE robots (pp. 76-77). The snowmobile build on p. 75 is also impressive. The last main theme covered by the book is Space Police I (http://lego.wikia.com/wiki/Space_Police_I), whose ships are often black and blue, with distinctive transparent red canopies. 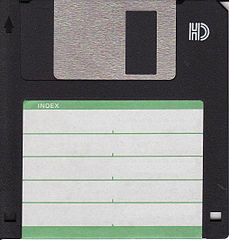 The authors bring these into a more modern palette by changing the shade of blue and using many pieces which were not yet manufactured during the Space Police I theme (1989-1991). I find that the writing is cliched and lackluster. The story is completely forgettable (I am struggling to remember one aspect of it after having read it about 2 weeks ago). I don’t think you would miss much just by looking at the pictures and admiring the models and skipping the story entirely. The models are incredible in this book, and so too are the lighting and photography. This is an extremely well produced book, and some of the two page spreads could have come straight out of a movie. For instance, see pp. 154-155 which shows 3 soldiers in exoskeletons fighting off a mass of incoming aliens. The scene is shot from an overhead perspective, and you can see that the three soldiers are about to back right into each other, with no hope of escape. 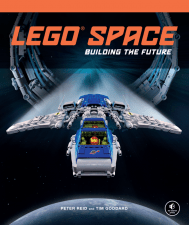 If you are a fan of the LEGO space themes that I mentioned, then you will enjoy this book. It is full of fan service (e.g. the Octania ship I mentioned earlier), and all of the models are top notch. They manage to evoke the original theme without just copying directly. They bring the old styles into the modern day, using updated colors and pieces, and taking advantage of the roughly 20 years of progress between these early sets and today. 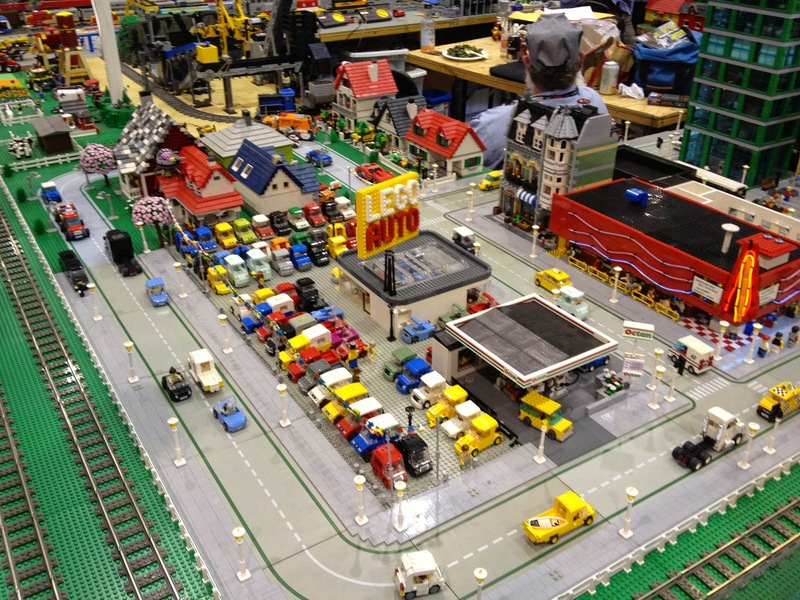 If you have ever gone to a convention where there is a LEGO exhibit, then you have probably seen elaborate displays of city life. Skyscrapers soar to the rafters, cars wind their way through the streets, minifigures enter and leave the various shops and establishments. They represent a moment in time in a city, either real or imagined. Prior to reading this book, I had no idea how these feats of creativity and engineering were accomplished. Due to the scale and complexity, I imagined that there must be multiple builders involved. I wondered how each builder ensured that his or her creation would fit with the rest of the city. Were there elaborate blueprints drawn up and exchanged among all of the crew? 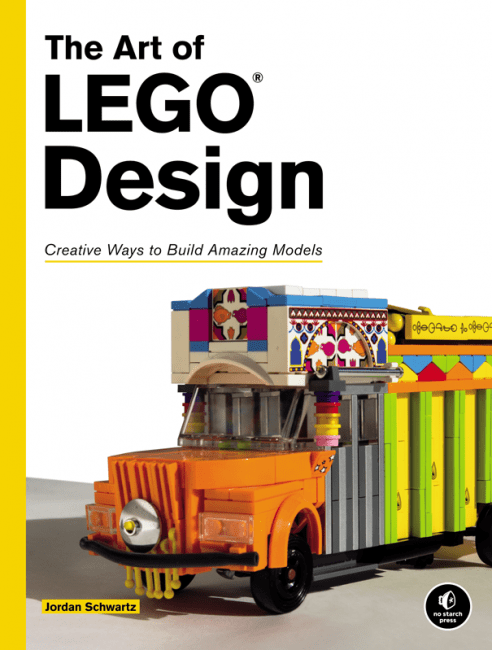 Brian Lyles and Jason Lyles, two brothers who build models for such displays, answer these questions and more in The LEGO Neighborhood Book. The first chapter details a standard of building sizes and part placement that allow the city to be constructed plate by plate and later joined together. This standard, known as the “Café Corner”, is a natural scale at which to build as it allows minifigures to be the inhabitants of the city; windows, doorframes, and other elements look an appropriate size next to them. 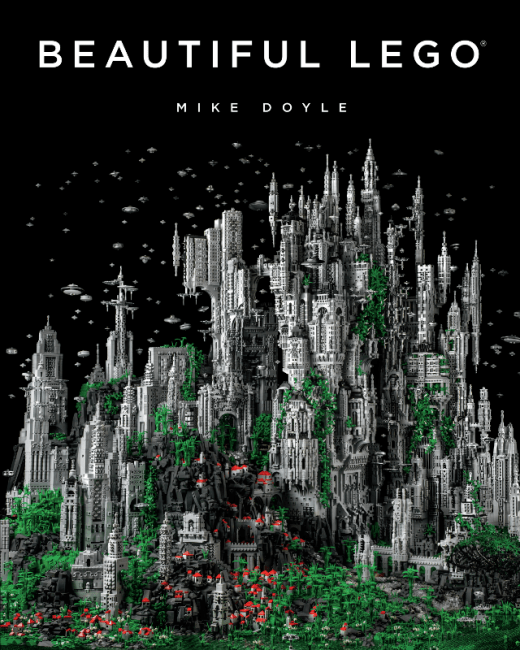 While cityscapes could be built at much different scales (the displays in LEGOLand in California, for instance, use a much larger scale to show even more detail), the book focuses almost exclusively on this minifigure scale world. The rest of the book concerns the design of these buildings, including such topics as choosing which buildings to build, how to incorporate color and contrast into the models, the importance of symmetry in brick placement to more closely approximate how real buildings are built, and most importantly, how to approximate details in the real world with the imperfect assortment of LEGO pieces that have been manufactured. The most interesting part of the book to me was the Bricks Everywhere chapter which shows photographs of buildings or building details like moulding or awnings and the pieces that the authors would use to represent them. It showcases the authors’ talent and expertise – I would not have thought of many of these solutions. Other sections of the book include adding details to the buildings through elements like columns and railing, windows and shutters, plant life, benches, scaffolding, stop lights, and various pieces of furniture that belong in different areas of a house. 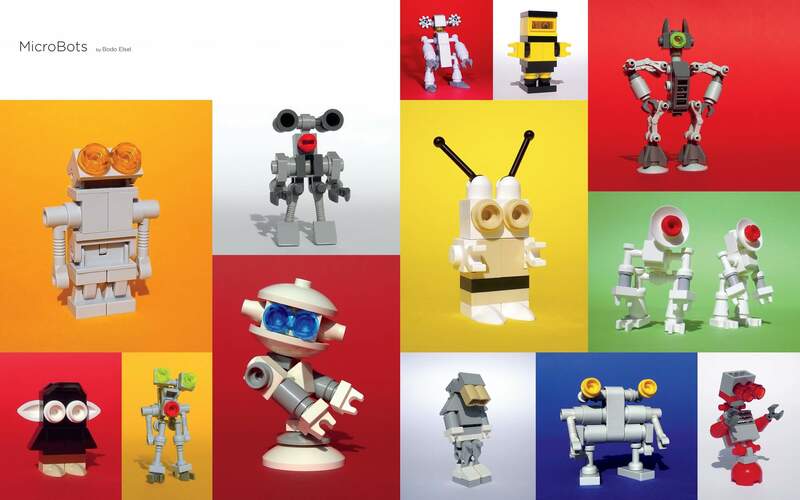 Most of the LEGO images are computer renderings rather than photographs. In my opinion this was a good choice as it more easily allows the reader to see small details in how they were built; these details are often lost when photographed. There are a few examples of their final creations which are photographed; the Chili’s example on p. 69 is particularly impressive. A large portion of the book is spent on step-by-step instructions for building two large buildings – one being a corner drugstore, and one being a home. The interesting part to me was that the last build is itself modular – the authors shows how the same base house can be transformed into a Parisian apartment, a Colonial Row House,and a Canal Ring House, merely by attaching different windows shutters, door frames, walkways and other elements to the front of the house. This books does a great job of explaining the basics of modular LEGO neighborhood construction. It provides dozens of examples of details and techniques that transform what could be a lifeless building into one that appears lived in and part of a real time and place. I have a few complaints about the book. One, I would have preferred if there were more text and meat to the book. Since it is comprised of so many pictures, it is a very fast read. I would love if there were interviews with other builders of this same style, particularly if they had different ideas than the two authors. The second complaint is that the book does not make clear who its audience is. 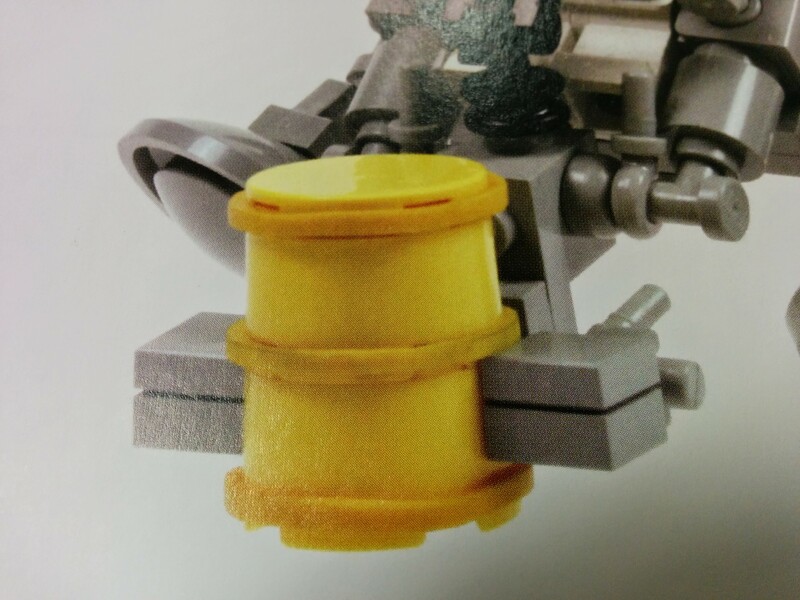 It mentions topics like SNOT (Studs not on top) but then doesn’t really explain how that technique works or how it could be used to good effect within these LEGO houses. This shows me that the authors expect their audience to be at least intermediate to advanced builders, which does not always match the tone and content of the rest of the book. Unofficial LEGO Technic Builder’s Guide by Pawel “Sariel” Kmiec, published by No Starch Press. Disclaimer: I received a free copy of this book to review from O’Reilly. I have a deep and abiding love for all things LEGO. Growing up, I assembled a few Technic sets but never really tried to make any creations on my own with that system. I received a great set last Christmas, the well-loved 8421 crane model. I enjoyed the process of assembling it tremendously, as it had great small details like working doors on the cab and a brilliant modular design. I was eager to review this book because Technic interests me but I know so little about it. Bottom line up front – this is one of the best, most informative books I have read. It exceeded my expectations in its breadth and depth of topics covered and its effective use of illustrations. It is divided into five sections – basics, mechanics, motors, advanced mechanics, and modeling. I did not expect such a thorough explanation of all the physic and mechanical engineering principles that are necessary to make working models. The first Basics section covers such concepts as speed, torque, power, friction, traction, and backlash. The author proceeds to cover more specific concepts related to vehicles, such as drive trains, front wheel versus rear wheel drive, turning radius, and center of gravity. I was familiar with some of these terms but not others (for instance, “Backlash describes the gaps between mating components, such as two gears”). Only after exhaustively covering these basic mechanical principles does the author tackle Technic specific elements, such as pins, axle holes, units of measure in the LEGO system, important ratios (for instance, 3 plates = 1 brick in height), and the difference between beams and bricks (studless vs studfull). This section was very interesting to me as it gives precise names to pieces that are hard to describe otherwise. The second section of the book covers mechanics, with an in depth looks at gears, chains and pulleys, levers and linkages, pneumatics, and reinforcing models to avoid being pulled apart by the stresses of the system. Almost all of these concepts were new to me, with the exception of gear ratios. The author introduces real world mechanical devices/techniques (such as the Chebyshev linkage), describes what they are used for (converting rotational motion into a straight line), and includes a fully realized Technic version of each system. Some of the systems are laid out in multiple steps, while others have just a single image of the completed structure. Still images allow you to get a sense of how the systems work, but the author also includes links to videos of some of the systems, which are much easier for me to understand. 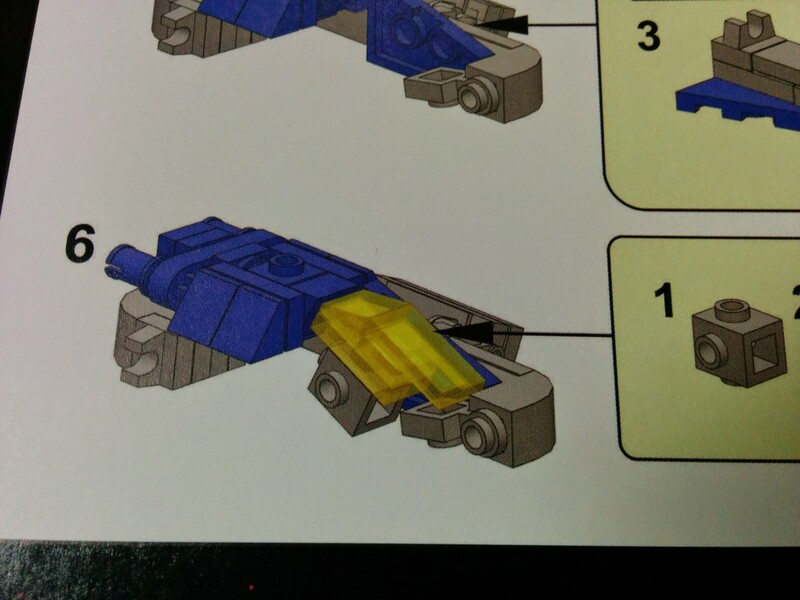 The third section of the book is an exhaustive look at all of the LEGO motors and their stats (torque + speed), as well as examples of what each is particularly well suited for (or not, as he has clear disdain for some of the models). Advanced mechanics covers steering, suspensions, tracked vehicles, transmissions, and the use of adders and subtractors. I found this section particularly interesting because I’ve never bothered to take the time to understand how a real world car works. After reading through the explanations and mentally visualizing how the gears would turn in each example, I have a much better understanding of what happens when gears shift in a car, or how suspensions help to keep vehicles in contact with the ground (not just to provide a smoother ride and act as shock absorbers, which I erroneously thought). The book concludes with a section on creating models, and the tradeoffs involved with using Technic to mimic real life objects. There is a natural trade off between form vs function, and the author encourages prospective builders to decide which one they’re willing to sacrifice before beginning to build. He discusses how to use blueprints to determine at which scale the model should be built, based on the fact that certain Technic elements are only available in a small range of sizes. For instance, if you’re modeling a car, you are limited by the size of the wheels – you could not build a 1/4 scale model, for instance, with off the shelf Technic components. As I said up front, this book blew me away with the amount of technical details it presented in a clear, easy to comprehend format. I found the figures in the book absolutely crucial to my understanding; I estimate that there are at least 200 such figures. Some are photographs (usually of his finished creations), but most are high quality 3D renders. The author makes consistent use of color throughout a section, and details what the color scheme means (for instance, a red axle might always be the one that is connected to the motor, while a green one is on the output side of the equation). My one nitpick is that it’s very hard to make out some of the figures on a monochrome display (i.e. the Kindle), but I was able to consult the beautiful PDF version if I needed clarification. This could have been a dry textbook, but instead it’s fun and eminently readable. The author’s quirky sense of humor manifests itself in some of the photographs, in which a hamster appears, ostensibly for scale. I’m inspired to try my hand at building my own Technic creations, and that’s about the highest compliment I can pay this book.